Visitation will be held from 5-8PM Friday, April 5, at Ferguson Funeral Home, 202 E. Main St. (St. Rt. 161 W) Plain City, Ohio 43064. Funeral services will be held 10 AM, Saturday, April 6, 2019 at Dublin Community Church, Gladden Chapel, 81 W. Bridge Street, Dublin, Ohio 43017, with Rev. Robert Tussing Officiating Burial Forest Grove Cemetery. 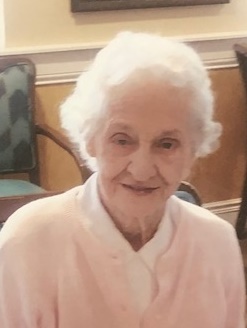 Anna McKitrick, of the Plain City/ Jerome area, passed away on her 101st birthday, Thursday April 3, 2019 at Hilliard Assisted Living Community. Born in 1918 to the late John and Ella Gray. Anna was a member of the Dublin Community Church and Columbus Metropolitan Area Church Council (CMAC). In 2002 she was the recipient of the Living Faith Award. She was devoted to her church and was dedicated to helping those in need. Anna loved people, working and helping others and cooking. She retired from RANCO where she worked in the payroll department. In addition to her parents, she was also preceded in death by her husband, Kelton “Gene” McKitrick in 1981. Anna is survived by her loving children, John (Judy) McKitrick, Belva (Carl) Aschinger, Jr.; grandchildren, Jon McKitrick, Jeffrey (Jodi) McKitrick, Julianna (John) Hink, Carl (Yvonne) Aschinger III, Cathleen (Mark) Aschinger Pugh, Christopher (Connie) Aschinger; 14 great grandchildren. Visitation will be held from 5-8PM Friday, April 5, at Ferguson Funeral Home, 202 E. Main St. (St. Rt. 161 W) Plain City, Ohio 43064. Funeral services will be held 10 AM, Saturday, April 6, 2019 at Dublin Community Church, Gladden Chapel, 81 W. Bridge Street, Dublin, Ohio 43017, with Rev. Robert Tussing officiating Burial Forest Grove Cemetery, Plain City. Ann was the mother of a good H.S. classmate (Belva) of mine. Most every time I returned to the Dublin area and would attend church at DCC, I would connect with Ann. At one time, years ago, Ann and I were in the DCC choir. It was back in the 50's and her husband, Gene, was also in the choir. At choir practice each week not only did the members prepare for the Sunday anthem, but we had great fun and enjoyed each other. Ann had a beautiful singing voice. Ann truly was a sweet, caring and wonderful wife, mother and friend.